I have managed to knit up just about all six skeins of Manos that had long lingered in my stash. The final FOs were more successful than the first few. 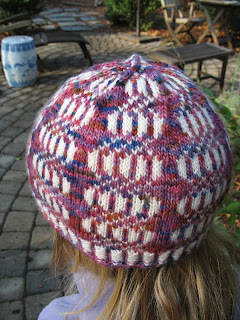 I made this with one skein of Manos and one skein of Douceur et Soie, another longtime languishee in the stash. At first, I questioned even using the Douceur, as they were very similar in color, but the addition of the Douceur added a very subtle sheen to the Manos, as well as a lovely halo. That, and I had no idea what I would do with this ball of yarn, having had it now for four years. I really did need a warm winter hat. I tried Thorpe, and we all agree that while it might be an excellent hat for a Mongolian, it was not so good on me. I then made Gretel. The slouchy Gretel. And it was wwaaaaaaayyyyy slouchy, as in rastafarian slouchy. Rather than simply rip it back to a more normal size, though, I decided to felt it a bit. This the point that my super-slouchy beret turned into a gigantic head cozy. The felting process caused the ribbing in the brim to lose all elasticity, and well, it was a mess. It was impossible to frog (thank you, felting), so I threw it out. I'm sorry I did not take a photo of it, since all our loyal blog readers truly deserved a picture of this monstrosity, but I just pitched it. Sorry, Gretel, maybe next time. 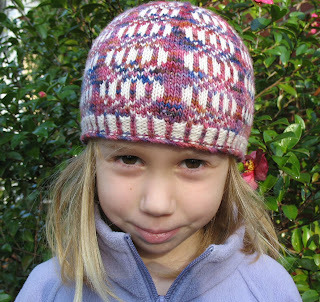 So I needed to attempt a third hat, and since I really do admire Kirsten's work, and after the personal failure of the Thorpe Hat, I wanted to give another one of her patterns a try. 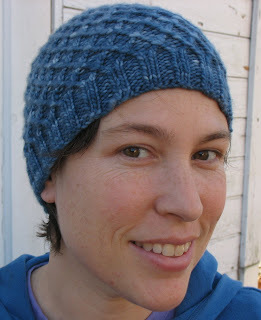 The One Day Beret is a top-down beret recipe, and it is totally customizable to any yarn or gauge. 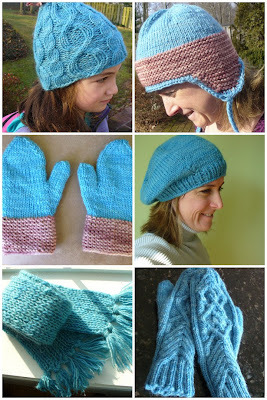 Once you get past those first few rounds, it is really simple and quick knitting. My bind-off ended up being a little loose, so I threaded some elastic in the brim and snugged this up nicely. A smashing success! I fell madly in love with Tikru's mittens when I first saw Grace's a few months back. Mine still need a good blocking, but since I've been wearing them every day, I've been unwilling to soak them and wait days for them to dry. They are a little too long than I'd like, but they do keep out the chill on cold mornings. 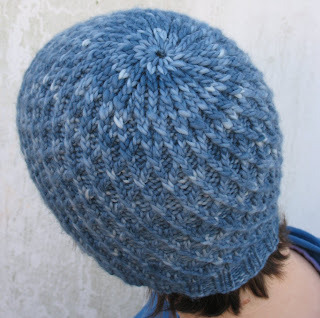 I also made a huge error by knitting these on Addi Lace needles. Pointy needle + single ply yarn + cabling without a cable needle = lots of splitting and poking of the fingers. I could have easily gone upstairs and gotten a blunter needle, but I was lazy. Thus, I deserve the finger poking. So, instead of making a whole sweater out of this yarn, as was my original intent, I made a ton of warm winter accessories, for me, for Rosebud, and for charity. What yarns can you set free? The Yarn Lounge was the site of a rare and unusual site: all three XRK bloggers, all together in one place! This week marked the second blog birthday of Crossroad Knits, and it happened to coincide with a friend's wedding in Richmond, so we had the perfect opportunity to celebrate together with fancy pastry and a visit to Yarn Church. We were warmly greeted by Stewart and Melanie and the other women of the Yarn Lounge, and managed to do some knitting, and some yarn purchasing too. At the heart of XRK is friendship. It began as a conversation among three friends, but it has grown to include so many others. And so, thanks so much to our readers, for sharing our passion for knitting, for encouraging us to keep talking, and for joining with us in friendship. Happy XRK Birthday to my two sisters-in-knitting and very dearest friends! So here are some FOs as yet unposted. Notes: It's easier to tote around socks when you are only working from 1 skein of yarn! Well, that was the only excuse I could come up with for not knitting these quickly. They were the BackBou's Xmas present which I am happy to report he loves. One minor complaint is that they slouch a bit much for him (I like the slouch myself). Maybe some ribbing changes and calf shaping would have helped with that. Notes: Quick and easy. When I'm not wearing these, the BackBou is. I'm planning on making some for the girls as well. I get compliments on these constantly. The yarn is really beautiful and warm. Our new Sunday activity is ice skating and these keep me warm while still allowing me to lace up the skates. Notes: I intended this to be for myself, but I noticed early on that my gauge was (duh) incredibly different in the colorwork and in the round. So I didn't stop (because that would have been prudent and sensible) but thought, "oh hecko, it's sure to fit someone ..." And so it does. R now has a new hat! 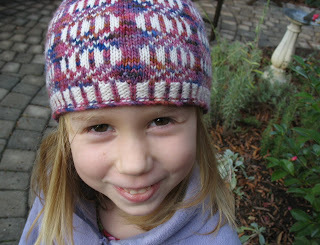 This pattern rocks -- I loved knitting it and could barely put it down. I am going to the yarn store today to buy another colorway to go with my remaining white so that I can have one as well! What can I say about this yarn other than every knitter should have some in the stash or on the needles. And I will encourage, by force if necessary, Liz and Mo to pick some up when we see each other this Sunday. That's right! An XRK summit in Richmond! Huzzah! You've surely seen Theresa's new feature on her blog, Time Machine Tuesdays? She is updating previously finished knits, on how frequently she wears them, and how the garments in general and the yarns in particular have held up. Theresa is encouraging other knit bloggers to do the same on their blogs, so that we can share each other's collective wisdom about the habits of our knits in the wild. I'd been considering posting Wear Reports myself, so with Theresa's encouragement, perhaps it will induce more frequent, less-just-the-FOs blogging. Pattern: Calla Lilly Socks (Ravelry link), knitted in June 2006, original blog post here, flickr page here. I'm going to start right in with the bad news. These socks have worn holes in both heels. I was a beginning sock knitter when these were made; I didn't have a lot of socks in the rotation at the time and they saw fairly regular use. The first hole came rather quickly, within months., so I darned it and relegated them to very light wear. The second one only got its hole in the last month and is set to be repaired soon. Now that I have knit many more pairs of socks, it makes sense that a soft merino with no nylon would be more suitable for light wear only, but I didn't really know that when I first knit these. I also want to point out that both socks wore out along the purl seam that bisects the heel. This Welsh Heel construction was a lovely design choice, but I have to wonder if this created a weaker point in the fabric, or maybe just a convenient seam for the worn stitches to run. I haven't made other socks with a welsh heel, so I won't make a generalization. Just an observation. The good news about this sock is that the amazing colors that Sundara is known for are still vibrant and true, and that there has been minimal felting, pilling and shrinking. I do carefully handwash these socks in Eucalan and hang them to dry, and would recommend careful laundering, but I was pleased to see that the colors did not run or fade, and that the socks did not become a mass of pills and felt like other non-nylon merinos. I have other Sundara socks that have held up better, again, with light wear. 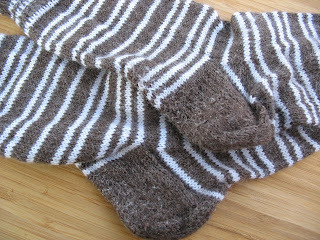 They are far too pretty to throw away, and the first darned sock is holding up beautifully. The holes in the heels of these socks are emblems of wisdom learned the hard way, that unless the yarn has nylon, wear the socks gently and infrequently! I'd love to read other wear reports on other blogs, so please do let me know if you plan on revisiting any of your knits for a quick review! 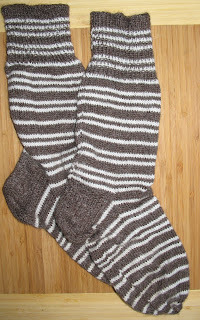 Last night I finally finished the BackBou's socks. They are his Christmas present. I am cognizant of the fact that it is January 11th. That's 17 days late. Technically. Because Christmas should be in our hearts all year long, right? I shall have to post about them later since he put them on immediately and has yet to take them off. Good man. So today I have nothing on the needles (eek!) and so many delicious ideas! Could these yummy skeins of Koigu become my new chevie? Could this skein of Spirit Trail Sock Yarn become Socks for Veronik? or possibly Whitby socks? Time to cast on! Enjoy your knitting! I've had this sweater's worth of Manos in my stash for a couple of years. A lustrous turquoise, I got it on sale during our lean years in Virginia, and it felt like an incredible indulgence at the time. I wound some, swatched some, even started to make a sweater with it, but it never got made into anything. I diligently considered tons of sweaters, and spent endless hours surfing Ravelry to match the right project with this yarn. Until I finally figured out what the problem was. I do not want a sweater out of Manos. I just don't. I also really love turquoise, but I do not want a turquoise sweater. I just don't. But turquoise is a flattering color for me, especially near my face, so I decided to wantonly break into my sweater's worth of Manos, and make myself a warm winter hat to match my down jacket. I started with the the Yarn Harlot's Unoriginal Hat, and it was too small, despite multiple modifications to account for my yarn's different gauge. So I slapped on a huge pom pom and gave it to Rosebud, who also needed a warm winter hat. This week's spring-like weather does not have me fooled. I know I have many more freezing mornings at the bus stop ahead of me, so I tried again, this time, making Kirsten's Thorpe hat, with some contrasting pink Nature Wool Chunky from the stash. This hat fit, but it definitely didn't flatter. It took me a day or two to realize that through. 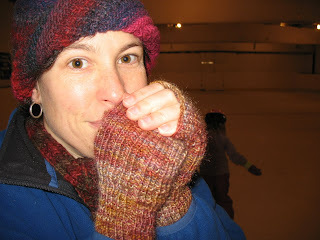 And in the meantime, I had begun matching mittens. The color combo stopped working for me altogether, so the hat and mittens are headed for Dulaan. Yay for serendipitious charity knits! But I am undaunted. I'll start hat #3 tonight. It is a good omen to start the new year with a victory, isn't it? I know this little, unassuming mass of stockinette seems like nothing much, but for me, it is wearable proof of how far I have come as a knitter. I have this commercially made sweater, a boatneck pullover knit with a fuzzy mohair-type yarn, knit at a larger gauge so that the sweater is lightweight but warm. It had seen a lot of wear for a couple of seasons, but it has gotten a bit ratty, and is ready to be retired. Enter the Deep Breath sweater from Webs. I generally don't look too closely at their patterns, but this one caught my eye since it was for a sweater in laceweight yarn. I had never really considered using my laceweight stash to make a sweater, but I liked the idea. I could have easily purchased the pattern. It costs $1.50. Seriously. But I have, in the past, bought patterns for some top-down sweaters, and felt really suckered in the end. I know I've said it before, but I'll say it again. If you have Barbara Walker's Knitting from the Top, you do not need a pattern to make a sweater. You need a decent sized swatch, a measuring tape, and a calculator, and that is it. So I used the measurements of my commercial sweater as my guide, and cast on. I was pleased to find as I knit the sweater that I would not need any shaping in the body, since the fabric created by knitting this yarn at this gauge (about 5 spi) is wonderfully stretchy and sexily clingy. So while I planned for no negative ease (I didn't want the fabric to stretch or look distorted over the bust), I didn't have to decrease for the waist. The fabric did all the work for me. But when I cast off, lightly blocked and tried the thing on, the neckline was way too wide. It drooped and made the armscyes too deep. It rendered the sweater unwearable. The body fit beautifully, so I was loath to frog the whole thing, and cutting off the yoke and grafting was also a bad option in this yarn, which is a bit sticky and shows every uneven stitch. I tried to crochet an edge at first, but it still sagged in the shoulders. So I began to pick up stitches at the neck, and experimented with necklines that would raise the entire yoke of the sweater. 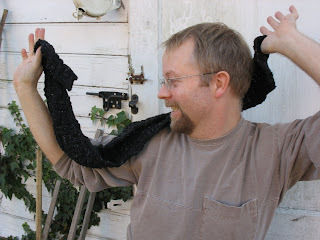 My mind eventually drifted to one of the very first sweaters I ever tried to make for myself, the Mohair Cowl Pullover from IK Winter 2004. Due to an unfortunate yarn substitution, it was also the first sweater I ever made and them immediately frogged. I referred to the instructions to make a cowl, threw in a couple of short-rows in the front to lengthen the cowl, and eventually ended up with a drapey cowl that is perfect for short-necked, graciously endowed, petite gals like me. 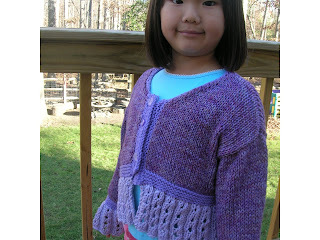 It had the added plus of totally camouflaging the old garter-stitch neckline, and fixing the fit issues beautifully. 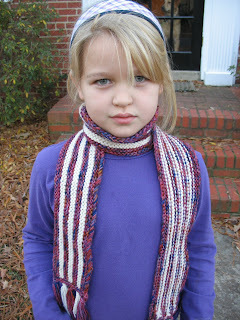 The cowl does change the overall effect of the sweater, which was intended to be a lightweight layer to wear over a tank. Now, it is cozier and looks great layered with a tissue-tee, although it isn't exactly appropriate for the arctic chill we've been experiencing. I regret using yarn-overs for my raglan increases, but I do think that they'll take the sweater into warmer seasons over the aforementioned tank. It feels like a full-circle moment, this sweater. This is the sweater I was going for four years ago. Four years ago, there is no way I could take a swatch and a sweater in my closet and make something that fit and flattered. I could never had said things like "threw in a couple of short rows" or "I planned for no negative ease." I could never have problem solved my way out of a loser sweater into a winner. This is a great way to start the year! Pattern: a combination of the Deep Breath sweater and Barbara Walker's Top-Down wisdom. Yarn & Needles: Touch of Twist Zephyr, Dianthus colorway, purchased at MDSW for nine dollars, a little less than 900 yds. Addi Lace US 6 needles gave me a gauge of 5spi. I'm just going to act like I didn't stop blogging, okay? We started New Year's Day with our traditional family hike at Pocahontas State Park. The trail is only 2.5 miles, but the wee ones can make it challenging. This year's hike got cut short due to Rocket Man's bloody nose and then my slip and ungrace slide down some rocks. Boy, that's going to hurt tomorrow. 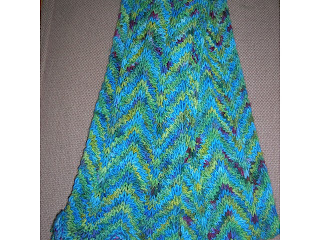 Chevron Scarf from Last-Minute Knitted Gifts in Koigu PPPM and Colinette Jitterbug. I wear this everyday if I can. It makes me feel great! I'm on the last sleeve of Rowan's Dinah, so hopefully, I'll have something lovely to show you very soon. Now that I've remembered by blogger password, put new batteries in my camera and gotten a taste of some completed projects that I love, I plan to be back a lot more in 2008. Life here at Chez Ann has finally calmed down. Christmas decorations are down and packed away (when they go up the house feels cozy, by New Year's Eve it feels like I can barely turn around it's so crowded in here). I was able to visit with many, many friends (including my film friends from NYC -- check out Adrian's website for viewing suggestions) and family. We travelled in the midst of it all up to Johns Hopkins for a 2nd opinion (daughter N was born with a foot birth defect and surgery was recently suggested) where we received our best present of the season -- a "no surgery necessary" opinion from the chief pediatric orthopedist. Hurray! So medical issues have receded, travel is over for a while, and the entertaining has subsided. Time to post all those knits I gifted as presents! Notes: This is the first time I have used this yarn and it now is my absolute favorite 100% Wool yarn. I have always balked at the price, but you get a ton of yardage and the colorways are just incredible. Wouldn't a BSJ in this yarn be delicious? I go mine here but please my knitting friends, do yourself a favor and knit with this yarn in 2008! They don't seem to have a website, but you can contact Ken and Grayce here. This scarf was a present for the girl I mentor at a local school (I did get her a book also, it's not just about fiber mission work ...). *Notice something different under that hat? Notes: What can I say? Jared is a genius. The hat fits like a dream. 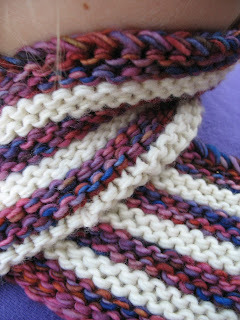 The yarn is soft and warm and the colors are stunning. It was hard for me to hand this over to my MIL. But I did. I must make one for myself in January! I found the cable needle burdensome at first, but developed a rhythm quickly and didn't mind it at all after a while. The crown decreasing is really beautiful. If you click on this link and scroll down a bit, you can see how great it looks in a green -- nice work Cate! Notes: I really treated myself to some good yarn for holiday knitting, didn't I? Yup, another yummy yarn. 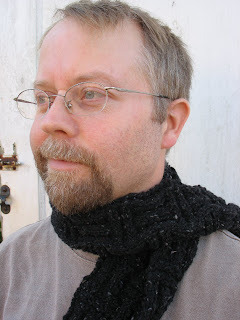 The darkness of the color made this hard to photograph well (despite the excellent model), but it really does look nice up close and feels light yet warm around the neck. This was gifted to my FIL -- my in-laws received the handknits along with some Norway themed goodies in honor of our upcoming trip to Norway together in June. Any yarn related travel suggestions for Norway? Lay them on me! I am currently working on the 2nd sock for the BackBou (the first wasn't even cast on until Christmas Eve -- he is very understanding and patient). I hope to post a completed pair soon! *Yup, that is short hair sticking out from Koolhaas -- I was able to donate 13 inches of hair to Locks of Love right before Christmas!